The SK2-3300 is a compact 3-way high-performance LCR loudspeaker built upon the same technology used in the acclaimed Project K2S9900, one of the most advanced and sophisticated loudspeakers in the world today. The HT4V THX-certified, Symmetrical Vertical Array bookshelf loudspeaker can accurately reproduce today's dynamic digital movie soundtracks with superb clarity and pinpoint imaging. The HT4V can be used for all five channels, or can be combined with other HT models for a complete home theater system. 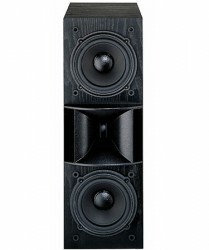 Package contains 2 speakers to serve as left and right main speakers. The JBL HT4H also features a straight-line single path crossover network, a FreeFlow flared rear port, and a rear piston type foot for correct speaker positioning. In addition, the JBL HT4H competes with floor-standing/bookshelf/center speakers from the JBL ES series and the JBL Cinema Sound series.